Today’s journey into the Portraitsphere features an illustration I happened to see recently in a fall issue of Vogue Magazine (yes, I’m a little behind), printed at about 2″ in height. The feature was “The Editor’s Eye”, which is an inside look at just what a particular editor personally likes/owns. 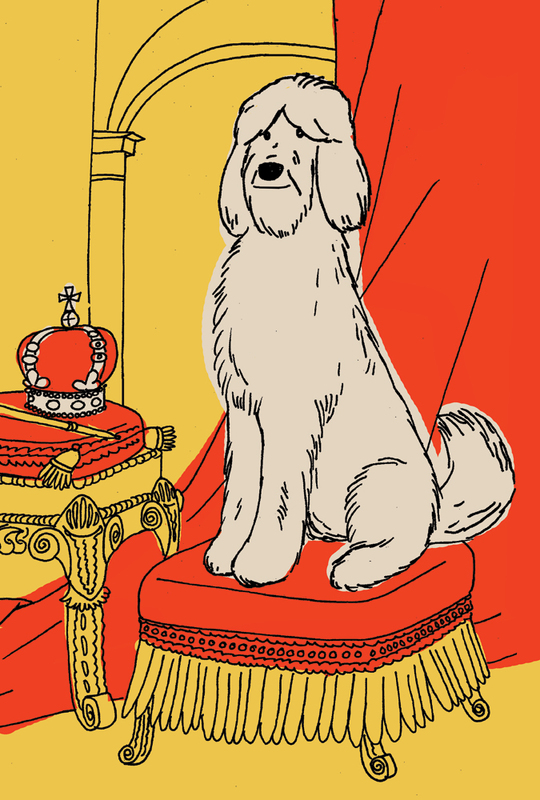 This installment was all about Vogue’s Social Editor Chloe Malle, and the subject of this portrait is her beloved Goldendoodle Jerry by illustrator Marz Jr. And based on the other embellished items shown in the feature, it appears Marz Jr. nailed her style with the crown, table, tassels and fringed setting. One of her other favorite items, a pair of Charlie McCarthy salt and pepper shakers, initially did seem a bit out of place…until I realized that her grandfather was Edgar Bergen, and her father was Louis Malle, and so her mother is Candace Bergen. Like I said, I’m a little behind. Thanks to Marz Jr. for permission to use his work in this post. To see more of his work, visit his website here.